Teenager Amy Marren beat GB team-mate Stephanie Millward to gold in the SM9 200m individual medley at the IPC Swimming European Championships in Eindhoven. The 15-year-old led from start to finish to win in a time of two minutes 35.10 seconds, almost three seconds clear of Millward (2:38.08). "The medley is an event that is close to my heart," Marren told BBC Sport. "To come here and win a medal - I'm over the moon." Marren, who was born missing part of her right arm, had been beaten by Millward, 32, in both the 100m and 400m freestyle events earlier in the programme. But Millward was full of praise for her younger rival. "Amy keeps me swimming hard and fast and we are always pushing ourselves," she said. "She deserves the gold and I'm lucky to race her." Sascha Kindred won his third gold of the week in the S6 100m freestyle, although he was unable to make it four titles after he finished third in the SB7 100m breaststroke. But the 36-year-old, who made his international debut 20 years ago, was happy with his week's work. "I came here to win freestyle gold and that is the most sweet result for me," he said. "I couldn't have expected to come away with five medals from my five events, especially as I've had back problems over the last while. I'm astonished with what I have done." "It was great to see Amy Marren winning another major title and continuing to perform on the international stage. I'm surprised she didn't beat her own European record but she has had a busy year with GCSEs to consider and she seemed to have dealt well with it all." Susie Rodgers and Andrew Mullen also won their third golds of the week - Rodgers taking the S7 100m freestyle and Mullen the S5 200m freestyle. "I could see Denise Grahl on my right and I knew she would be fast on the first 50m so I wanted to stay ahead of her," said London-based Rodgers. "It's been a busy programme for me and I've not been having much sleep but it is working." Mullen, 17, came to Eindhoven having never won a major international title but said his hard work is paying off. "I was expecting to swim well here," he admitted. "I've always been close to medals but I thought this was the time to break through and win titles." 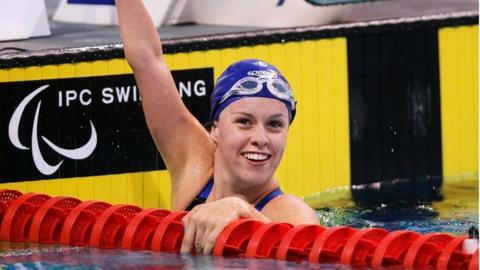 But Ellie Simmonds was beaten for the second time this week by Ukraine rival Yelyzaveta Mereshko. The four-time Paralympic champion had to settle for silver in the S6 100m freestyle with Mershko also breaking the Briton's European record with 1:13.80. There were also silvers for Matt Walker and Hannah Russell, while in the S14 200m freestyle events, GB won silver and bronze in both the men's and women's races with Tom Hamer and Jessica-Jane Applegate finishing ahead of team-mates Jack Thomas and Chloe Davies. And Eleni Papadopoulos won her first major international medal with bronze in the S10 200m medley to take GB's overall medal tally to 51 medals with two days of action remaining.